You may be aware that I am quite fond of vehicles. OK maybe obsessed would be the right word, and Vulcan bombers are a particular favourite of mine. Whenever I've had spare cash I've been trying to support the Vulcan to the Sky trust to restore, and fly Vulcan XH558. She is now the only airworthy Vulcan left. She has been doing displays and has been much enjoyed by many people. She is now struggling. She has been hit with a cash flow crisis. The staff at the trust have been given a months notice and at the end of October the Board of Trustees will have to make a decision on her fate. They haven't got the funds now to keep trading till next year, when she has all her bookings to attend displays. There is a risk this last flying Vulcan may have to be sold to another country to keep her flying. I think it would be a great shame to lose this piece of our history. So if you've been thinking about supporting her in the past, this is the moment. There is merchandise you can buy in the online shop, or you can just donate her some raw cash. If, like many I suspect, you would like to support her but don't have the spare money, how about passing on the message that she needs a hand? It costs you nothing and could make all the difference. 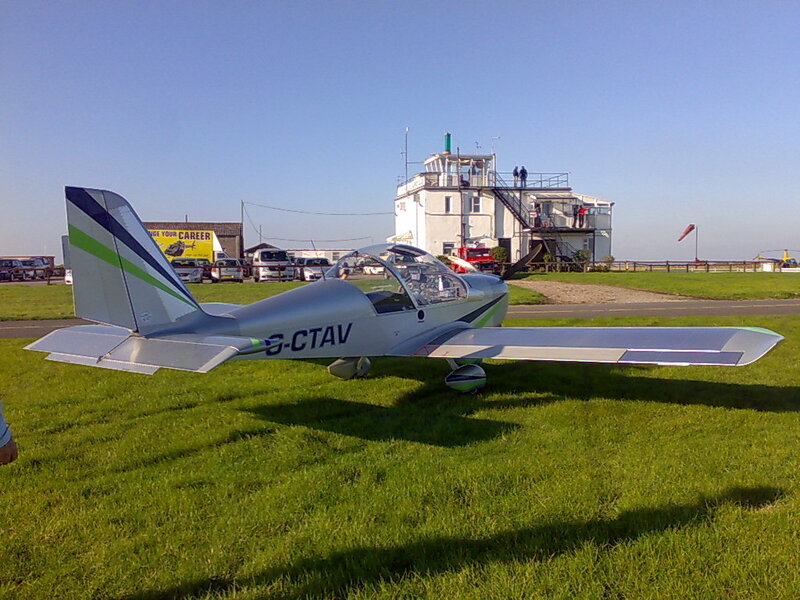 As they say, she is the peoples aircraft, only people can keep her in the country and flying. 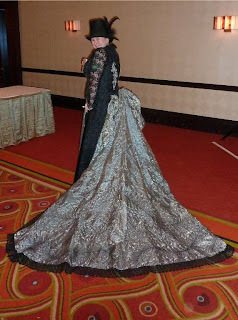 Well as promised here is a bit more information and a lot more pictures of my dress. The name came from Susan Briscoe. It's what she said when she blogged about it and it was all I could think of when I needed a name urgently for a quilt show. It often happens that someone else will name my work for me. Some pieces know their name before I even start them, but others like this wait until someone tells me what it is. Lets start with the notes I made when I was first thinking about this project. 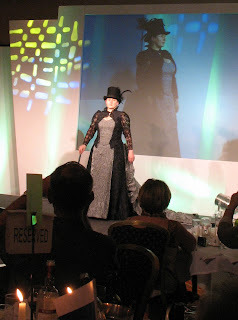 For the evening wear I fancy a victorian outfit. It's simple and I know the drill. I think I can get the patterns flat enough to make it pretty simple to quilt as well. I've been giving this some more thought. 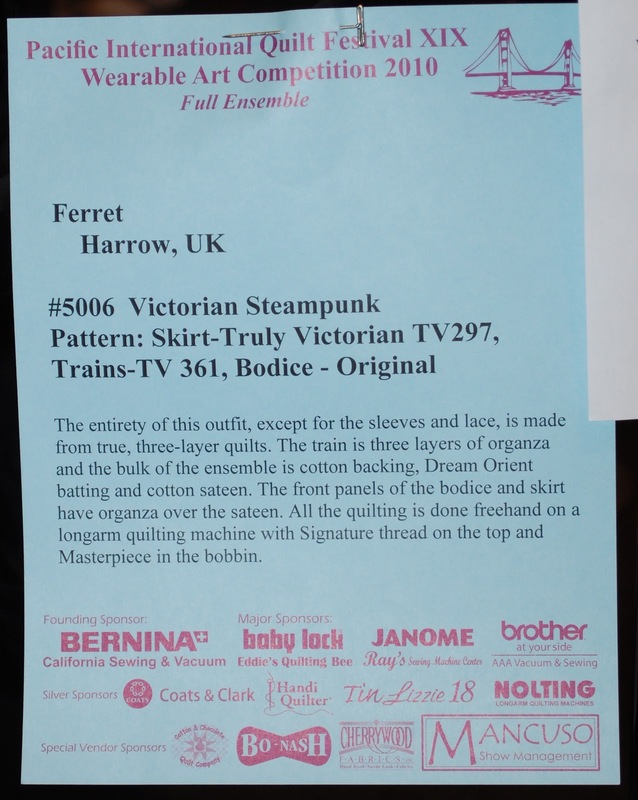 I think I will aim for a heavily quilted, heavily boned bodice. 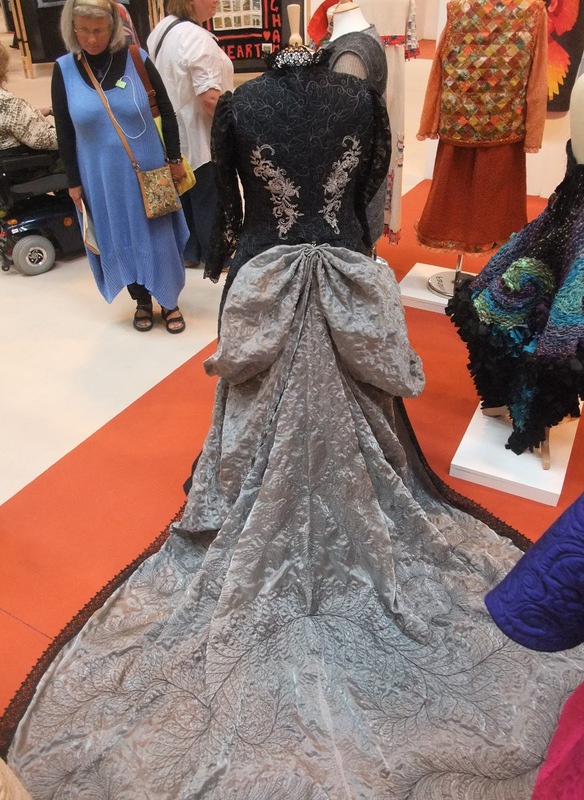 A fan back skirt and a butterfly bustle/train. What if I make the train of two layers of organza quilted together? The quilting should show well, the train would be light and it won't be too hot. I have to model this in August under hot lights. After some investigation I think I have a short list of patterns. I don't think I can face a bustle if I have to make a quick change. So instead I will go for something later. Having had a good look on the Truly Victorian web site that's quite handy. 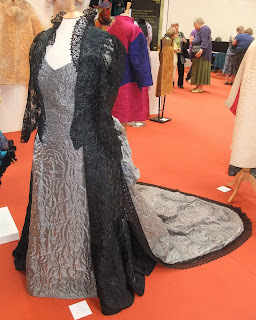 The bodice I want to work from is from this later period and won't fit over a bustle either. panel, but I can't work on the sides much with that one. I think the simple walking skirt TV291 is probably my best bet. Plain and simple, just ready for me to play with it. So that was my cunning plan and it seemed reasonable. Even better these were all patterns I already owned, and I could lay my hands on them at once. I did and put them in a safe place ready to use. I got on and ordered the parts I would need for the outfit from Vena Cava. When those arrived I did try to put them in the same safe place as the patterns.... yes you guessed it, they had vanished. 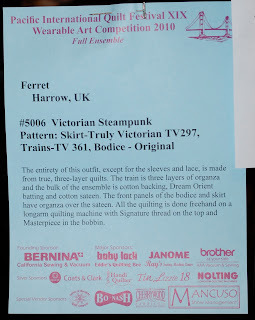 It wasn't ideal but at least I could get more and I know Truly Victorian are pretty good at getting things shipped promptly. I placed the order and started work on the fabric for the train. I had a fair idea how each of the patterns would work and I knew that my goal was to make as many of the pieces up as possible while keeping them flat. If I can reduce the number of seams I increase the quilting space. That meant I was pretty sure I could just make one huge piece for the train then pleat it into shape when the pattern arrived. I decided to make the train the maximum width I could fit on the frame and a bit over 10' long. I settled on three layers of organza, so the train would meet the definition of a quilt, "three layers held together with stitch'. 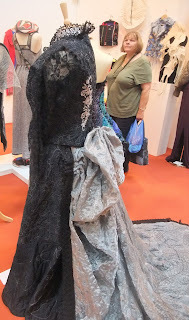 The outer layers are silver and the middle, wadding, is black. Of course the organza wasn't very wide, only 45" so I needed to join it to get the full width of the train. On the other hand I really didn't want to see a seam in it. What to do? Something crazy of course. I decided to just overlap it slightly and hope for the best. I knew it would be structural after quilting but I wasn't sure how it would behave on the frame. Put simply, it didntt behave at all. It wriggled and slipped, and was a huge pain. It didn't seem to matter how many pins I put in it, it still shifted. I just had to fight it all the way to keep my three layers together. maybe I should have tried 505 spray, but I have a feeling that would have just stuck to the machine as well and made matters even worse. I started quilting from the end of the train. I used black thread and put in a feather with curved ends, largely guessing the shape I would end up cutting the train. I steadily added more feathers, changing the thread ever so often to lighter shades of grey. 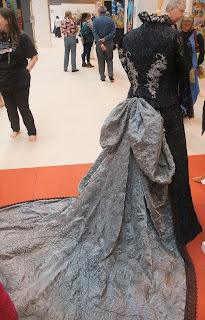 The pleated area of the train is quilted with my curls in a thread that almost matches the organza. A lot of people who have seen it thought it was just a textured fabric, but no. It's plain flat organza and a lot of quilting. The train alone would be about the size of a kingsize bed quilt. It turns out that quilting organza isn't too much of a problem apart from the slipping. It's something I will probably do again but perhaps not such a large piece. By now the patterns had arrived. Of course as soon as they did I found the originals, and I can't see how I missed them before still it means I have to make a lot more mistakes to get stuck right and that is always good. The bodice and skirt are made from cotton sateen, with Dream Orient as the wadding. The wadding was a very lucky find from Asding. It has a lovely drape and is very light. I did change my mind about which patterns to use. I decided that the skirt needed to give the train some support, so I needed to have more fabric in the back. I felt that TV297 would do the job without having too many panels, or hiding my quilting or needing a bustle. I also decided to extend the back hemline. 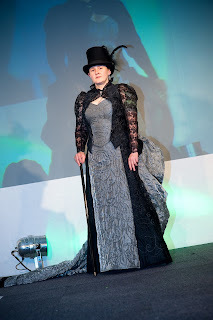 I would normally have worn petticoats with this type of outfit, but knowing I had to make a fairly quick change that wasn't an option so the skirt had to do all the work itself. I loaded the longarm with the lining of the skirt and the wadding then rough cut the large bottom panels of the skirt from cotton sateen. Before cutting the sateen I joined the two pattern pieces together anc cut them as one piece. It wasn't as efficient and it didn't give such good grain lines, but it gave more quilting space.I made sure they were quite a bit oversize to allow for the quilting drawing them in. I quilted one then traced the design onto washaway stabiliser so I could copy it onto the other panel. The upper panels of the skirt I made in a similar way as with the lower panels I removed what seams I could before quilting, but with them I used a smaller allover pattern that didn't need any marking. 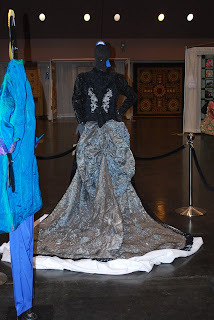 The front panel was cut not only from sateen but also from organza. This I cut even more oversize to have plenty to pin into place. This worked well as it did indeed slide well on top of the sateen. The quilting design I drew onto washaway stabiliser before trying to quilt it because I wanted it to be mostly symeterical. I think the stabiliser also helped hold the organza steady. The bodice I decided to just quilt yardage for. There were too many seams to do anything really clever (simply) and I was thinking I would have to play with the fit too. The only exception was the center front panel which is made in the same way as the one on the skirt. The fun really started when I tested the bodice pattern. I had one that I have used before so I tried that as the starting point for this one. It wasn't the shape I wanted but that was easy to change if it fitted. Fortunately I made up a test. I put on the sample and was initially very please. It was looking good. Until I moved my arms, one comedy hulk moment as all the seams in the back gave way. OK so I have put on some weight, time for a new pattern. I remeasured and made a new test. Well I didn't burst the seams this time but it still didn't fit. The new one was too big in front and tight at the back (and I had already added more to the back than the front). Third time lucky. I used the original front with a recut back, putting all the extra material over my shoulders and upper back, perfect (if a little scary, this is what quilting does for you). Having six cats and a lot of delicate fabric I headed out to my motorhome to build the ensemble. It seemed easier that way. 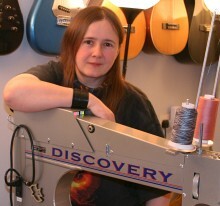 So all the construction was done with the Singer 99, a hand cranked sewing machine. To be honest I think it made things easier if slower. It's the first time I have sewn in that many metal bones without breaking a single needle. Of course it is also more authentic to the outfit, though it's one of the few things that is. As I wouldn't have time to get into a corset for the fashion show I knew the bodice had to do it's best to do that job too, but still be quick to put on and not have visible lacing. I settled for two lines of hooks and eyes, one on each side of the center front panel. I could have just used one set, but then that side of the bodice would have sat differently and the fastening would have been more obvious. It was twice the work both in construction and dressing but I think it was worth the effort. 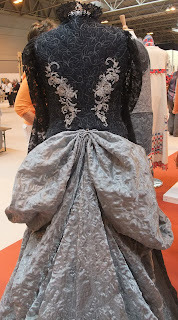 The silver designs on the back of the bodice are premade panels that were added after the rest of the construction. 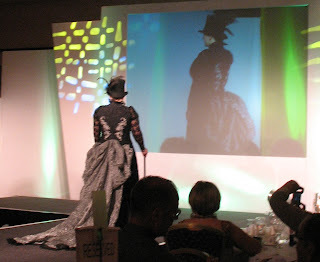 For the show I wore the outfit with a top hat (yes I know, not period) a cane and a brooch to hold the neck of the bodice closed. The cane was more than just a prop. To try and look a little more elegant I was wearing rather high heels, which I don't do often, and so I am not very good at it. 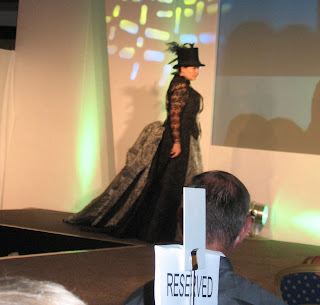 The cane greatly reduces the chance of me tripping over my own feet :) The hat was largely to give me a quick way to get my hair up, again knowing how much I had to change in a very short time, I was looking for any short cut I could find. I think that is about everything. If you do have any questions feel free to leave a comment asking. There is a DVD including footage of the fashion show being given away with British Patchwork and Quilting this month. 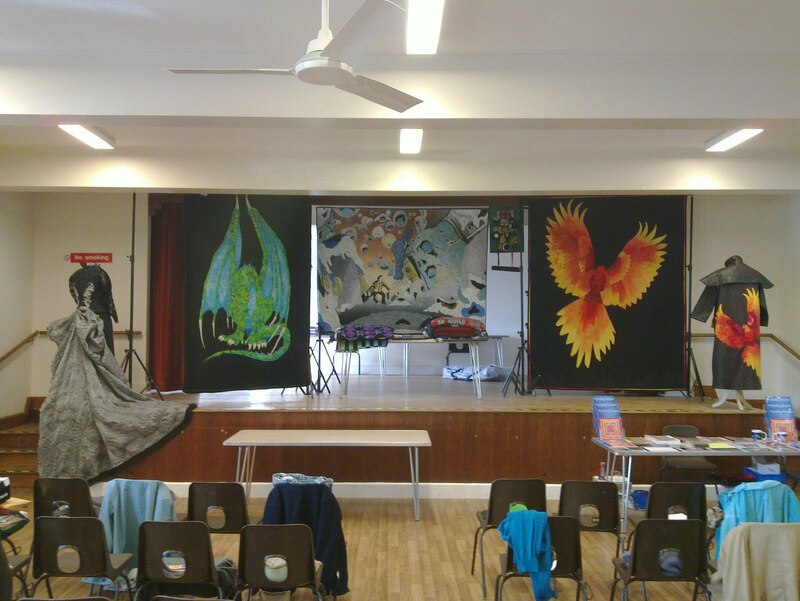 You have to send off for it but it should give you a feel for all the items in the show. There is also footage on there of the dueling longarms, something not to be missed. Remember earlier I commented that the train on my dress wasn't propperly displayed? 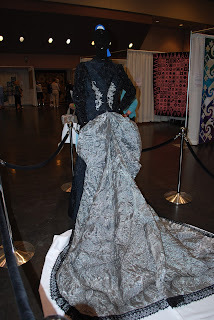 Well Mary Kay Davis from The Quilt Show has found a white glove lady to fix it for me. Doesn't it look better now? I am so greateful to both of them. It's a little thing, but it means a lot to me. Sending the picture to prove it was fixed was just the icing on the cake. I wonder if there is anything the team at The Quilt Show can't do? 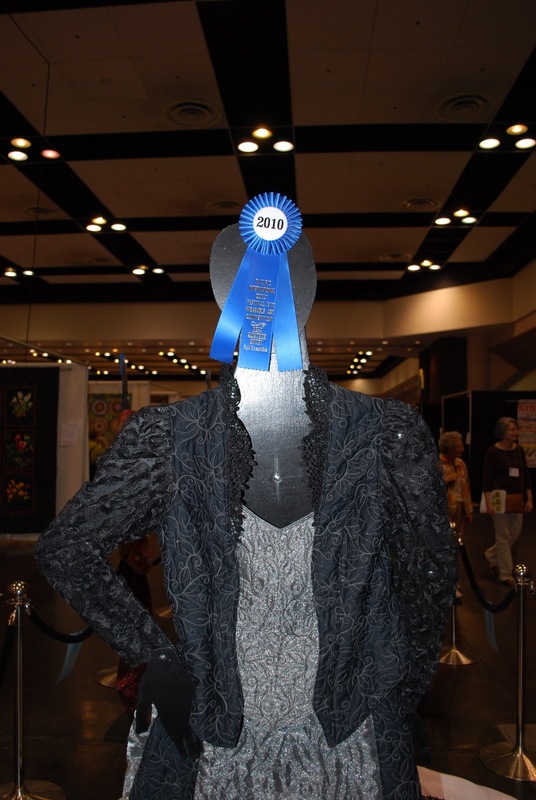 Well the winners are up from Pacific International Quilt Festival. One of my friends in the US has sent some pictures through. I am thrilled with my blue ribbon, it is a slightly odd award. 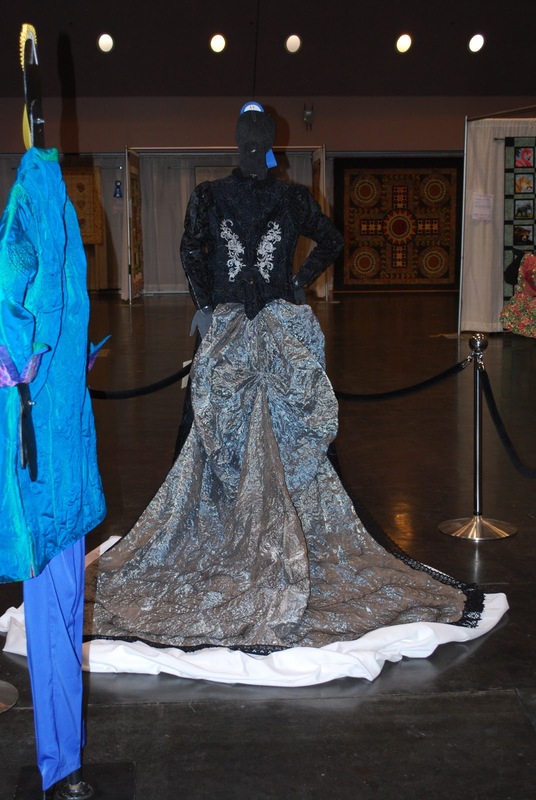 It's best Amateur Entry, What's odd is being an amateur, but in fashion and dress making I am by their rules and my profession so there you are. It still feels strange though, it's been a while since I entered any show as an amature, but then this is the first time I have entered a garment let alone three pieces. I have spotted that the train isn't on quite right and I am hoping I cn get word back to the show so that by the time most of the people see it it will be correct. I am touched that they have taken care to protect the train fron the floor, it's a nice touch that they might not have bothered with and that sort of care does speak very well of them. I had hoped to have time to write a description of how the dress came together before the show but I just haven't had time. I will try and get it up Sunday as that is the next day I have time at home, so please check back then if you would like to know more about it. 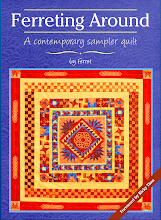 I've also heard a rumour that both Tet and I are in British Patchwork and Quilting Magazine this month. I haven't had a chance to check it out yet, but it sounds like I need to. I think this will also be the issue where you can send off for a DVD of hilights of the Festival including coverage of the fashion show and the dueling longarms. At least I hope I will be home for dinner, but right now it's tea time in Leicester. Yup I am having a day off for a change, other than the inspirtion we found while flying. I lied. The picture of students on the last post were Dayspring quilters who were making Speed Quilts on Friday. I blame the small screen for the error. This post has the Norfolk Quilters making Art Quilts. I've got a few minutes before tonights talk so I thought I would share some pictures from the weekend. 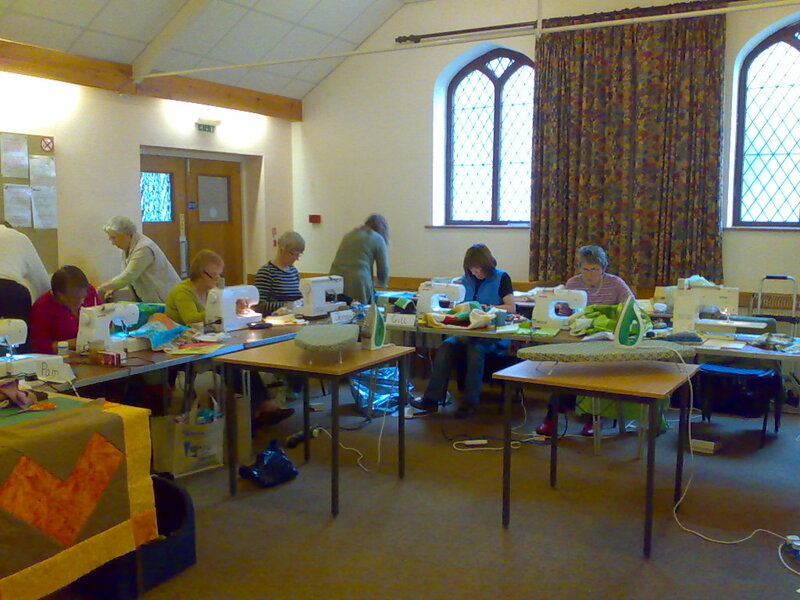 These are all from the Norfolk Quilters AGM. As you can see the hall had a great stage so I was able to set up all my quilt stands as well as my garments. 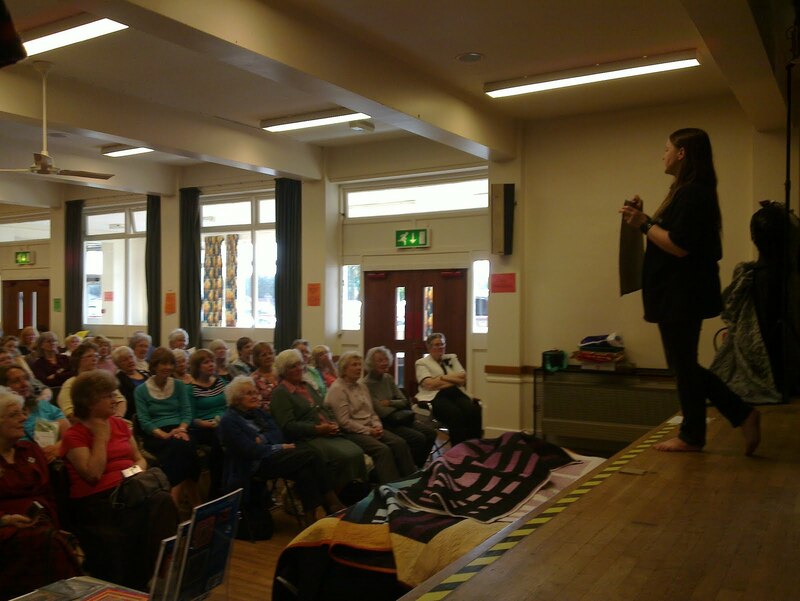 A high stage also helps a lot when it comes to holding up quilts, as I am a bit short. Tet even managed to get a picture of me in action so to speak. 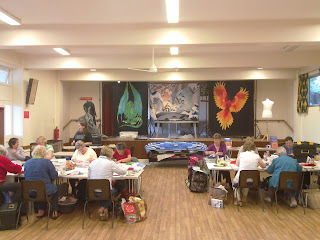 On the Sunday we did Art Quilts by Numbers, and the students all did really well. I think everyone was at least ready to quilt by the end of the day. Very well done ladies. I am now in the New Forest, give or take. It's a lovely day and once I got past the M25 the traffic was good too. I realised on the way here that I have been through at least 7 counties in the last 24hours. Not bad going, and those are just the ones I remember seeing. I really like the county signs on the motorway it makes me feel I am actually getting somewhere.